Identification: This species has a straw colored shell with fine, wavy spiral striae. It is marked with spiral rows of irregular white patches. When very young, the shell is decorated with widely spaced spiral brown lines but in mature animals the lines are replaced with irregular axial streaks. The animal is translucent-gray with irregular brown patches and scattered white flecks. 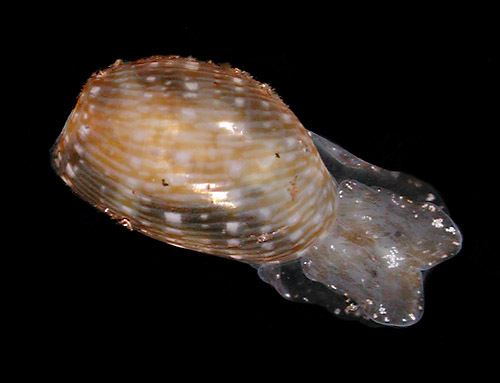 Natural history: Hamineobulla(?) kawamurai is a moderately common species found in rocky habitats at depths of 2-9 m (6-30 ft). It occurs at moderately exposed to highly exposed sites but is most common at the latter (where it may be the most numerous haminoeid in short algal turf exposed to high surge). It lays a spherical, white egg mass anchored in algal turf. The eggs hatch in about three days in the laboratory. Distribution: Maui, Kauai and Midway: widely distributed in the western & central Pacific. Taxonomic notes: There is some question about the validity of the genus Hamineobulla (Terry Gosliner, pers. com.). It is illustrated in Severns, 2011 as #8, plate 190 (misidentified in the caption as Limulatys muscarius--caption switched with #10, plate 190). Some sources place it in the family Bullidae. Photo: CP: 4 mm: Honokowai Beach Park, Maui; April 11, 2010.